Run literally thousands of applications with tasks as mundane as word processing to finding you the nearest cab when you come out late at night. Which bits are important when looking for a smartphone? In this guide we will have a look at all the important parts which make a smartphone work and explain some of the technical jargon which gets used to describe how they function. This is one of the most important features. Not only does it function as the viewing screen for reading messages, emails, watching movies and playing games it will on nearly all smartphones also function as your keyboard so it needs to work really well as a touch screen and viewing screen. As our demand to be able to watch video and live tv on smartphones has increased so the manufacturers have responded by increasing the screen size. You would expect your smartphone to have a minimum screen size of 3.5 inches increasing to 5 inches and over on some of the new smartphones which border on a cross between a phone and a mini-tablet. 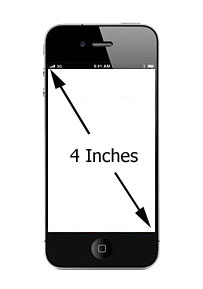 Screen size is measured diagonally across the screen from corner to corner just like on a television. A better way to measure resolution is to count how many pixels are in a defined area (either per number square inch or square centimeter) This calculation takes into account how big your screen is. You will see the figures quoted as either pixels per inch ppi or pixels per centimetre ppc. Modern screens use a new technology called AMOLED or Super AMOLED which stands for active-matrix organic light emitting diode. This is a technology which enable screens to have much higher colour contrast and reduces power consumption. They produce very dark blacks and intense colours. Some manufacturers have there own brand names for the screens such as Clear black and Retina display. Remember that one drawback of large screens is much higher power consumption so your battery need re-charging more frequently. A processor is simply the phone's brain, it controls everything your phone can do. We measure how good a processor is by how fast it can work. The number of separate tasks it can perform in one second is called a 'cycle' and you will see the term GHz used which is a gigacycle. 1Ghz is a big number - one billion cycles per second . As a broad rule of thumb a faster processor will perform better because it can cope with working on lots of tasks at the same time, perhaps downloading a video clip while updating your email and running a weather app all together. Look for a smartphone with a processor speed of at least 1GHz, otherwise it may struggle with demanding tasks. In the last couple of years phone manufacturers have introduced dual core processors. Having two chips means the phone is better at multi-tasking as one can handle background tasks while another can work on your active task. The extra power also means faster interfaces and enables new functionality such HD video recording, plus because each core works less hard to accomplish a task, the phone should use less battery power and the processors do not overheat. We've now started to see phones that run on quad core processors. In theory quad-core chips promise even faster performance and better battery life but we're yet to be convinced that they're really necessary as currently there are few applications that can make use of this extra power - though that will change in the future. Memory is of course used for storing information, be that photo's, phone numbers or music. There are different types of memory and it is useful to know a little them. RAM - This is short for Random Access Memory and it is type of short term memory the phone uses when doing tasks. It is important that it works properly otherwise your phone will become slow and stop working properly. Cache - This helps out the RAM if it cannot keep up with the processor because it is working so fast. Hard storage - the phones internal memory chip and - micro SD cards - these are little removable memory chips. All smartphones have some inbuilt memory for storage but on cheaper models this will be limited and can soon get full. Cloud Storage - This is when your phone sends it's information be that video / photo's, music etc out of the phone into the internet and it gets stored securely on another computer for you. It's a bit like having a school locker, you don't need to carry all your heavy books around with you so you drop them off. Not only does this boost the your available storage space but it means that your photos and videos won't be lost if your phone is broken or stolen, and because your files are stored online it's easy to share them with your friends and family. Even if your phone does not include it as a free option you can always subscribe to a cloud based storage provider. To use cloud storage you sign up for an account (often free) with a provider like DropBox. You then have your own secure storage space which you can access from any computer or smartphone. It depends what you want to store! Phone apps can take up a surprisngly large amount of memory. Many smartphones boast what sounds like a lot of memory but in fact a lot of the memory space is taken up storing the operating system and apps so the usable portion left for you is much smaller than you had expected. Most smartphones have a microSD slot so you can easily add extra memory. Make sure that the memory card you buy is compatible with your phone before buying. iPhones do not have memory card slots - Apple would prefer you to buy their more expensive higher capacity phones. Because smartphones have large screens and can perform lots of power hungry tasks, their batteries often last for less than 24 hours. Some heavy phone users even carry spare batteries but many newer phones have sealed backs meaning you can’t swap in a new battery if it runs out of power. Modern smartphone batteries are usually a type called Lithium Ion. This has a very high energy density, meaning it can store a lot of electricity while still being small and lightweight. Other advantages are that they can be charged must faster than older batteries (sometimes in as little as one hour) and they hold their charge well, even when the phone is switched off. The capacity (meaning how much power the battery can store) has been increasing as phones have required more power to operate. The power of a battery is measured in mAh which is short for milliamp hours. This is a measure of how much power the battery could provide continuously over one hour. Therefore a battery rated as 1000mAh could supply 1000 milliamps for one hour before it went flat. Battery capacity tends to vary between about 750mAh right upto 3100mAh in the Samsung Galaxy Note II. Smartphones need a lot of power. The best premium models can give up to 300 hours standby time and 10 hours talk time but more typical figures would be 150 hours standby time and 5 hours talk time. Remember that these figures will drop sharply as soon as you use any of the phones smart features such as browsing the internet or playing games. Therefore realistically your phone will probably need recharging every 24 hours. Having a smartphone means that you no longer need to carry round separate cameras, music players and laptops. The typical mobile phone camera resolution is now over 3Mp (megapixels). This is still short of the standard mid-range digital cameras but resolutions are rising. Most mobiles can also record video though again the quality varies dramatically. Premium models, such as the iPhone 5, can even record in 1080p Full HD. Some phones are now equipped with two camera's - the main rear facing higher quality one for taking your main pictures and a front facing camera enables you to makes video calls using services such as Skype or Apple's Facetime and taking the so called 'selfies' (self portraits) . The resolution and quality of the front-facing camera is usually inferior to the rear, main camera. Read our easy to understand guide to phone camera's for more information. This determines how your phone, looks, works and feels. It is vital and controls everything from the little sounds it makes to how it can surf the web. Smartphones come with the operating system already installed and you cannot change it so it is very important that you buy a phone with a system you like. There are four main smartphone operating systems: Apple iOS, Google Android, Windows Phone and BlackBerry OS. Each operating system has its own app store where you can browse what’s on offer, read user reviews and then download your chosen app. 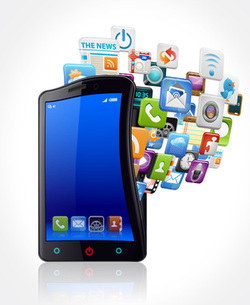 Apps come in all shapes and sizes – there are game apps, news apps, food apps, business apps – many of which are free. All smartphones come with their own mapping service and GPS receiver ( GPS is short for Global Positioning Satellite - basically it means the phone can receive information from satellites, by comparing information from 2 or more satellites it can work out your exact location on earth - down to just a few metres!) This can help you plot routes and many will even provide turn by turn voice navigation, just like you’d get from a dedicated sat nav. 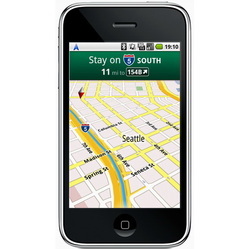 Smartphone navigation can be better than the sat-nav systems sold for cars. They also have the advantage that they are always updated for free. Nokia have a particularly good system which they use in the Windows phones. MP is short for media player and you will commonly see the abbreviation MP3 or MP4. It is important to understand the difference. All but the cheapest phones include music players that allow you to play digitally stored music tracks (you’ll need a reasonable memory in order to save a decent size collection). Most phones will come with a supplied set of headphones but these are usually inferior to good quality separate sets. Tip: If you want to use your own pair of headphones, look for models with a 3.5mm socket so you can plug it in. Built-in video players let you watch pre-recorded movies or stream videos from the web. However to really enjoy these you’ll need a smartphone with a large, high resolution screen. A web browser lets you browse the internet, well known browsers are Internet Explorer, Google Chrome and Safari. Smartphones have their own web browsers that let you access the internet on the go. These work in the same way as the web browser on your computer, so you can set favourites and often have multiple pages open at the same time. Surfing the net on your phone can be expensive (especially data hungry activities such as streaming videos) so if you plan to spend a lot of time online then it’s a good idea to choose a phone contract that includes a generous data allowance. Even the most basic £10 phone lets you keep in touch with your friends. But spend a little more and you can make phone calls around the world, surf the net at superfast speeds and even stream movies around your house. Whether the phone is dual, tri or quad band, and hence which frequencies it works on. All phones sold in the UK will be at least dual-band and so can be used throughout Europe and many other countries (though you usually need to arrange this with your provider). A tri-band phone will work in most of North and South America although some areas may need a quad-band device. If you plan to surf the web on your phone then you’ll want a device that offers at least 3G connectivity. Older or cheaper phones can go online via 2G (alternatively called GSM) but this can be painfully slow. 4G is a new mobile phone technology that offers download speeds that are up to five times faster than 3G. See our Networks page for an explanation of how it works and what you will need. This is a popular technology that allows an electronic device to exchange data or connect to the internet wirelessly using radio waves. This means you can connect compatible devices without wires to the internet either through your home network like a BT homehub or via a Wi-Fi hotspot in places like coffee shops or libraries. This is usually much faster than connecting over a mobile network and won’t use up any data allowance you may have on your mobile contract. Bluetooth is a way of wirelessly connecting your phones to other Bluetooth-compatible devices. It is similar to wi-fi but uses a short-range (1-10 metre) radio frequency and is slower so it is mainly used for transmitting audio and not video, so the devices don't have to be in line of sight of each other and can even be in other rooms. Bluetooth is mainly used for hands-free devices such as Bluetooth headsets and hands-free kits, as well as transferring files from a phone to a PC or vice versa. It can offers greater security than wi-fi transmission. DLNA (Digital Living Network Alliance) enables you to share music, photo, and video files across a wireless connection. So for example, you could connect your smartphone to your home Wi-Fi network, and stream movies stored on the phone to your big screen TV. NFC is short for 'near field communication' and lets you wirelessly transmit data over very short distances. It’s a similar system to Bluetooth, though NFC is much faster. Some smartphones come with NFC smart tags that can be used to change the phone's set up. For example you could swipe the tag in your car to switch on Bluetooth, enable GPS and launch the satnav app - much quicker and easier than having to manually change all the settings. But its NFC’s potential for making contactless payments that is causing most excitement and we’ve already seen the first phones that you can ‘swipe’ (like an Oyster card on the London Underground) to pay for items.